From the Ice Caves to the Crystal Caves. This mod for Nuclear Throne Together adds a Nuclear Throne version of Spelunky's "Wheel of Prizes" to dark areas (i.e. Sewers, Crystal Caves, Labs). The wheel works almost exactly like the one in Spelunky: put in 60 rads, and in return, you'll randomly gain nothing, twice your investment, thrice your investment (the "Jackpot"), or one of a selection of area-appropriate weapons. Use the command /fastwheel to reduce waiting time. The wheel spawns as far as possible from the weapon chest, so it may spawn at the level entry point, at the rad canister, or at the ammo chest. 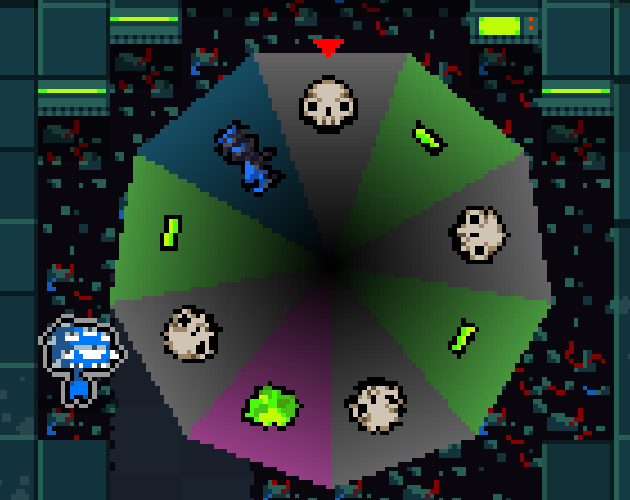 In the Sewers, the bloom from "b" tiles appears on top of the wheel. No way to steal the weapon.